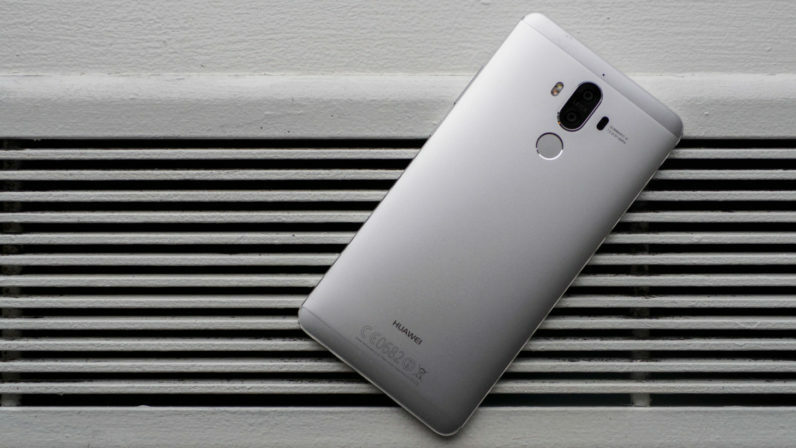 Huawei is announcing its next flagship phone today, the Huawei Mate 9 – and this time it’s coming to the US. Dual Leica-branded cameras, now with a 12 MP color sensor and 20 MP monochrome. While the 5.9 inch screen is huge, the phone is a touch smaller than the 5.7-inch LG V20 I’m currently testing thanks to fairly sparse bezels (though he V20’s screen is also about 5.9″ if you include the second display). That also means it’s just a little larger than the iPhone 7 Plus, and a slight curve helps it feel comfortable in hand. In Huawei’s typical fashion, the phone feels extremely well built. There’s no flex anywhere; it just feels like a solid slab of metal. The display is also top notch. I’d have liked to see AMOLED, but colors are vibrant and black levels deep. I also appreciate that Huawei lets you adjust color profiles and temperature to your liking. That said, 1080p at 5.9 inches does mean that text will look a little less sharp than on a QHD panel if you look closely enough, but the only real-world disadvantage is if you’re hoping for the sharpest VR experience once Google Daydream becomes a thing (Huawei hasn’t announced Daydream compatibility though). On the other hand, the resolution will help with battery life, which Huawei is rating at 2 days of real world use. Given the huge 4000 mAh battery – and that I’ve usually found Kirin chips to be very efficient – that may be possible with light usage. We’ll have to see about that overan extended period of time. Huawei beat the iPhone 7 Plus to the punch with the dual-camera system in the P9 and Honor 8, and this time the company has improved it further this time around with optical image stabilization. The Honor 8 already had great low light performance in my testing thanks to the monochrome sensor, so it’s fair to assume the Mate 9 will be better. It’s using some clever new software tricks too, such as letting you adjust white balance after you’ve taken a shot – what appears to be integrated RAW editing – and providing 2X zoom by inserting detail from the 20 MP monochrome camera into the 12 MP final image. The phone is running Huawei’s custom EMUI skin atop Android 7.0. While I’m really not a fan of EMUI aesthetically – ugly icons and some iOS-esque design touches – both the P9 and Honor 8 were some of the best performing phones I’ve tried in everyday usage, something I rarely say about devices with such heavy skinning. Moreover, Huawei says it’s implemented some custom optimizations to improve the Mate 9’s performance over stock Android, promising not only that your phone will not slow down over time, but that it will get faster. The gist is that the Mate 9 will use machine learning to figure out your usage patterns. Say you have a tendency to opening Twitter and Instagram after checking Facebook; the Mate 9 is supposedly smart enough to know to allocate resources towards those apps. In theory, anyway. We’ll have to see how all Huawei’s performance claims hold up over time, but its a promising claim bolstering a device that already has top notch specs and design. With Samsung’s reputation damaged by the Note 7 fiasco, now is just about the perfect time for Huawei to start staking its claim in the large phone flagship US market. Well, whenever that ends up happening anyway. Huawei assures us the device will arrive in the US, but doesn’t have a date yet. It will retail for around €699 (~$776) in Europe and Asia though. One last note: There’s a special edition ‘Porche Design Mate 9’ which will cost an insane $1,549 or so. That device does include a 2K curved display, 6GB of RAM and 256 GB of storage though, so you are getting more for your money. Stay tuned for our full review – of the cheaper version, that is – in the coming weeks.